If you've missed Woody, Buzz Lightyear and the rest of the gang. Now is the time to satisfy and relive your childhood yearning with Toy Story That Time Forgot. Disney Pixar brings us this all-new holiday special to premiere on ABC. Brave helmer, Steve Purcell, directs this short and special movie, featuring Tom Hanks as Woody, Tim Allen as Buzz, Kristen Schaal as Trixie, Kevin McKidd as Reptillus Maximus, Wallace Shawn as Rex, Timothy Dalton as Mr. Pricklepants, Don Rickles as Mr. Potato Head and Joan Cusack as Jessie. 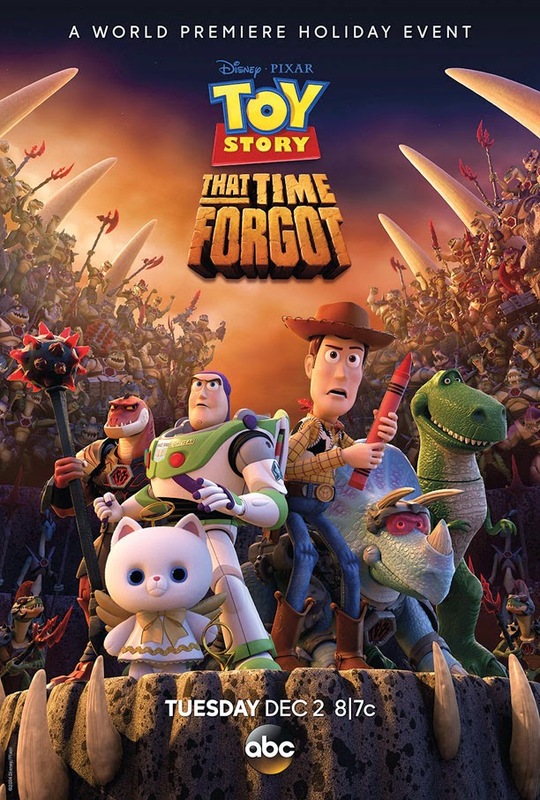 Check out the new poster of Toy Story That Time Forgot. During a post-Christmas play date, the Toy Story gang find themselves in uncharted territory when the coolest set of action figures ever turn out to be dangerously delusional. It’s all up to Trixie, the triceratops, if the gang hopes to return to Bonnie’s room in this Toy Story That Time Forgot. Disney Pixar's Toy Story That Time Forgot premieres in television on December 2, 2014, only at ABC 7/8c.